Cook pasta as directed on package. Meanwhile, snip off stem ends of sugar snap peas and remove strings if desired. Drain pasta; cover to keep warm. In 12-inch nonstick skillet, heat 3 teaspoons of the oil over medium-high heat. Stir-fry beef in oil about 2 to 3 minutes, until no longer pink. Remove from skillet; keep warm. In same skillet, heat remaining 2 teaspoons oil over medium-high heat. Stir-fry peas and carrot in oil about 3 to 4 minutes, until crisp-tender. 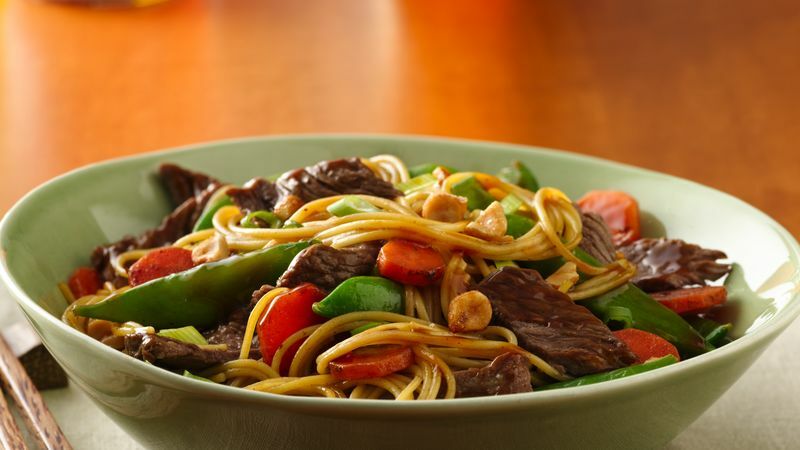 Stir in pasta, beef and teriyaki baste and glaze; toss until well blended. Serve in bowls; sprinkle with onions and peanuts. Teriyaki baste and glaze has a thick, syrup-like consistency and shouldn’t be confused with teriyaki marinade or sauce.